A new four-volume atlas covering Indigenous lands, languages, history and cultures will soon be found on the shelves of libraries and classrooms across Canada for the first time. Canadian Geographic's Indigenous Peoples Atlas of Canada has been published after years of research and design work by a team of five First Nations, Métis and Inuit organizations. Ry Moran, the director of the National Centre for Truth and Reconciliation, says the atlas is one more step in the truth-telling process in Canada — a step that has been long overdue. "Canadians don't know enough about Indigenous peoples' perspectives and histories," Moran told CBC Radio's All in a Day. "This atlas is bringing those voices and perspectives forward in a very authentic way, in a very comprehensive way. And it's going to help shape the future of this country." The atlas, which launched Thursday in Ottawa, encompasses thousands of years of history before European contact, focusing on Indigenous peoples' languages, original place names and cultures. Education ministries and teachers across the country can hardly wait for the new classroom resource, said Charlene Bearhead, a First Nations educator who worked on the atlas. Bearhead said Canadian Geographic, which published the book, was committed to listening to Indigenous peoples across the country during the two-year process. "[These four volumes] really reflect that authentic voice, and the multiplicity of voices of Indigenous people in this country," she said. "I think they did a really great job of capturing that visually." The four-volume print set includes a series of giant floor maps, and is accompanied by an interactive website and an educational app. That app was trending Saturday, three days after it launched, as the number one education app in the country. Moran said that, for a long time, Indigenous children across across Canada didn't have the chance to see themselves in the textbooks and educational material used in their classrooms. "It was as if they were told you were here once here but not anymore, which has been ... devastating," Moran said. The Indigenous Peoples Atlas of Canada teaching resources will be made available to all Indigenous schools, Canadian Geographic said. It will also be distributed to 20,000 Canadian Geographic education members in the fall of 2018. 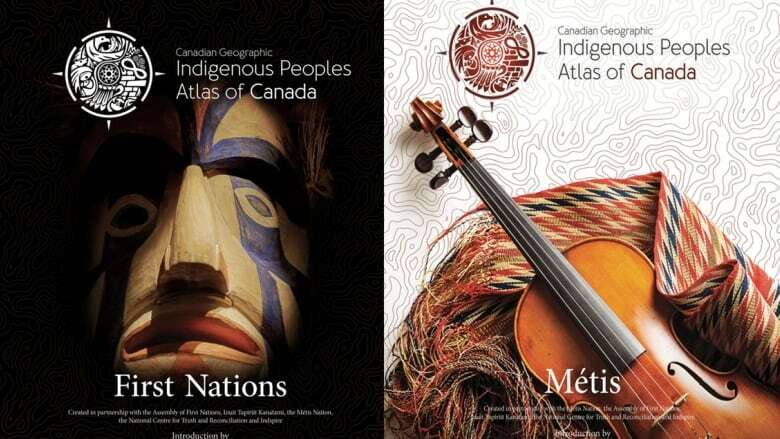 Three of the books in the four-volume atlas cover First Nations, Inuit and Métis peoples and perspectives. The fourth focuses on the Truth and Reconciliation Commission and residential schools. Moran said that volume delves into one of the very few remaining residential schools in Canada, documenting the Muskowekan First Nation's fight to preserve the site — and gain recognition for the children who lost their lives there. "Those types of stories are not pleasant aspects of our history but they're reflective of the long-standing efforts of Indigenous peoples to resist the continued erosion of their culture," he said. "That's where ... this atlas is so valuable. It's a celebration of the resilience, the strength of Indigenous elders [and] communities to hold onto this information and now share it with Canada."